A new garage door on your Canadian home does provide plenty of functional and aesthetic benefits. What you may not realize is there are also several financial benefits of having a new garage door installed. If you are debating between having your existing door repaired and investing in a new one, we encourage you to read the following financial benefits of buying a new garage door. A new garage door improves the energy efficiency of your home. If you are like most Canadian homeowners, you are constantly looking for ways to reduce your energy bills, from upgrading your home’s windows to having more insulation put into your attic. But do not overlook your garage too! Installing new weather stripping around the garage door and upgrading to a garage door with better insulation will also help improve the energy efficiency of your home and lower your energy bills. A new garage door requires less maintenance and has a warranty. If your current garage door is five or ten years old or older, it can be at the point where it needs continuous repairs. At some point, it can be common to have a garage door repair technician at your home every month. Even though repairs tend to cost less than a new door, in the long run, you are actually paying more in repairs the investing a new door now. If this sounds familiar, then you are due for a new garage door. Plus, your new door will require less maintenance and comes with a warranty! A new garage door protects your home better than an old, poor-functioning one. Older doors can be easier for thieves to get open and break into your home. While no one wants to come home to discover they have been robbed, it still happens. Modern garage doors are more secure and include better security features and options compared to five years ago. You can get electronic keypads that require inputting a special code to have the door open and close. Some doors and door openers also have special remote controls with enhanced security features. You will even find some openers have their own mobile app to open and close your door, as well as alert you if it has been left open or opened while no one is at home. 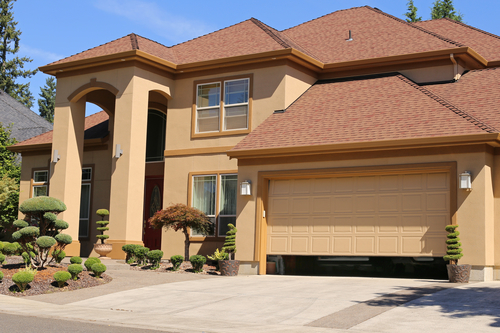 A new garage door can increase the value of your home. A new garage door not only helps enhance the appearance of your home but also can help increase its curb appeal. If you are planning on selling your home in the near future, you could actually get a higher sales offer. Even if you are not planning on selling your home, do not forget about the previously mentioned financial benefits you gain. For more information about new residential garage doors for your Canadian home or for assistance in selecting the best one for your home, please feel free to contact Richards-Wilcox Doors at (800) 667-1572 today!